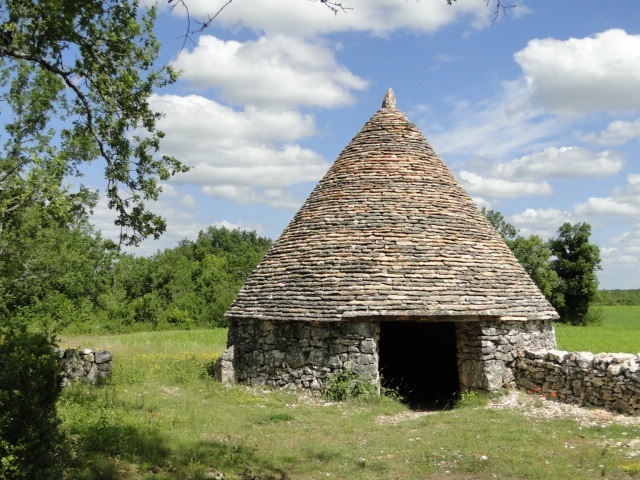 The presence of many dolmens (single chamber tombs from as early as 4000 BC), ancient Roman routes and intriguing gariottes (ancient, dry-stone shepherd huts) give a hint to the region’s long history. The Causses de Quercy, is a limestone plateau, and due to the scarcity of water people, historically, people gathered to share this precious resource at places such as wash-houses, with their angled- stone ‘papillons’, wells and animal watering holes, remains which are found all over the area. The surrounding area is rich with hiking-trails and walks and exploring on foot is highly recommended. The pilgrim trail of Les Chemins de Saint-Jacques de Compostelle, passes through the region and Lalbenque is the home to the organisation that brings together volunteers to repair and maintain this famous trail - Mille mains à la pâte pour le chemin de Compostelle -GR6. We shall be returning to see more of what their activities during 2018. Close to the town you can find the Les Phospatières de Cloup D’Aural. These ‘phosphate pits’, are open aired and more than 25 metres deep. The phosphate was mined at the end of the 19th century. Today this area is a great resource for palaeontologists who explore the chasm’s deposits for its contain unique fossils. Here there’s evidence of an evolving world from up to 160 million years ago. It’s possible to visit and explore this historical site, guided or otherwise, and full details of this as well as the areas many hiking routes can be found on the tourist office website. Whilst in Lalebenque do try to visit the 15th century, Église Saint-Quirin de Lalbenque which houses a truly magnificent gilded alter-piece. 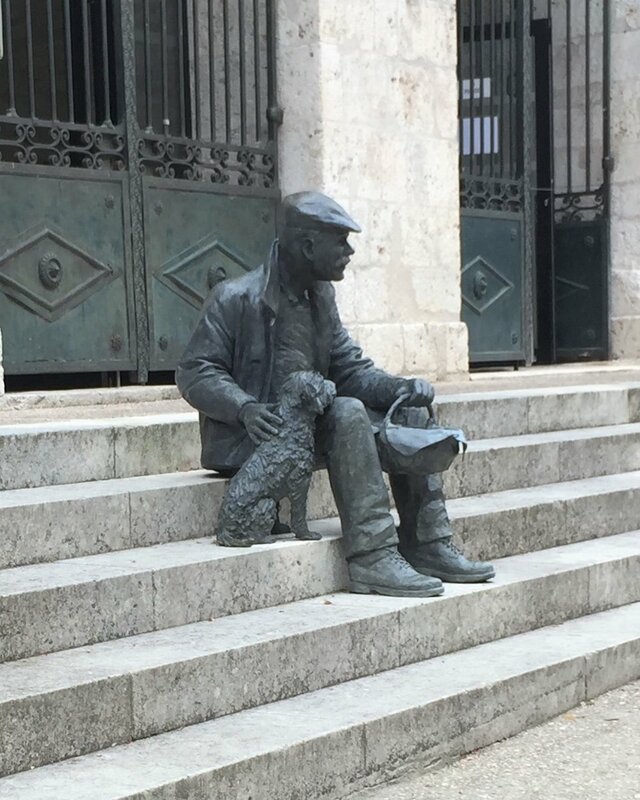 Last December a wonderful bronze sculpture of a truffler and his faithful dog was erected on the steps to the Mairie. This wonderful work was created at the Parisian workshop of Elisabeth Cibot and weighed 135 kg. So it was rather an event getting him, ceremoniously, sat in place. This enigmatic elderly truffler is a lasting memorial to the part played by truffles in the economy and culture of the area. When in the town you will find a selection of shops and places to eat, we would recommend that you call in and see Juan from Le Bistronome, a great café-restaurant-wine bar in the middle of town and which has a great reputation for food and its warm welcome. Juan seems to know how to throw a party! Lalbenque is officially recognised as a Site Remarquable du Goût, a distinction awarded to places of outstanding food heritage. The town is synonymous with the highly sort after Quercy BlackTruffles, produced in the chalky soil lying under the dwarf oaks of the region. What is a truffle? It’s actually the fruiting body of a Subterranean Ascomycete Fungus, and are ectomycorrhizal fungi and this means that it is found close to and are dependent upon tree roots. Hungry yet? Most things associated with the growing of this ‘black gold’ remain a mystery including exactly how they form in the ground (making predicting a harvest very difficult) and importantly just where they may be found. It’s rarely talked about: the local saying is that ‘the more you talk about truffles, the fewer you’ll find’. To be a successful truffle hunter requires an enduring passion as you typically have to wait for around 15 years to discover if a young truffle oak will produce! 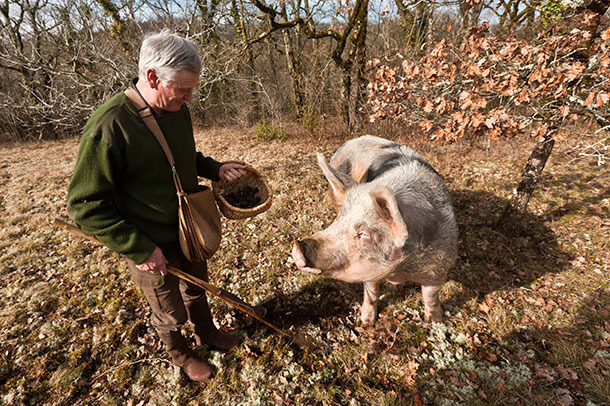 Truffle hunters use trained dogs and pigs to locate their precious crop. Hunters will know when to look in relation to the weather conditions that are likely to encourage their growth. The trick is to make sure your pig doesn’t eat its own weight-in-gold whilst hunting. Dogs are less likely to eat what they find. If you haven’t tasted truffle then it’s probably going to taste like nothing you’ve tasted before. Many people consider it an acquired taste. The originality of their flavour, their bizarre nature and scarcity ensure that they remain a luxury product with prices that often reaches €1000 per kilo. 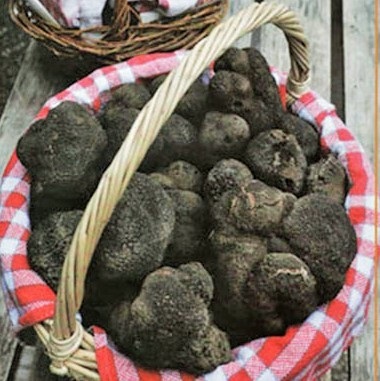 Local restaurants offer ‘truffle’ menus during the season and so a trip to see your market and enjoy a truffle-influenced meal, really should be on your winter ‘to-do’ list. 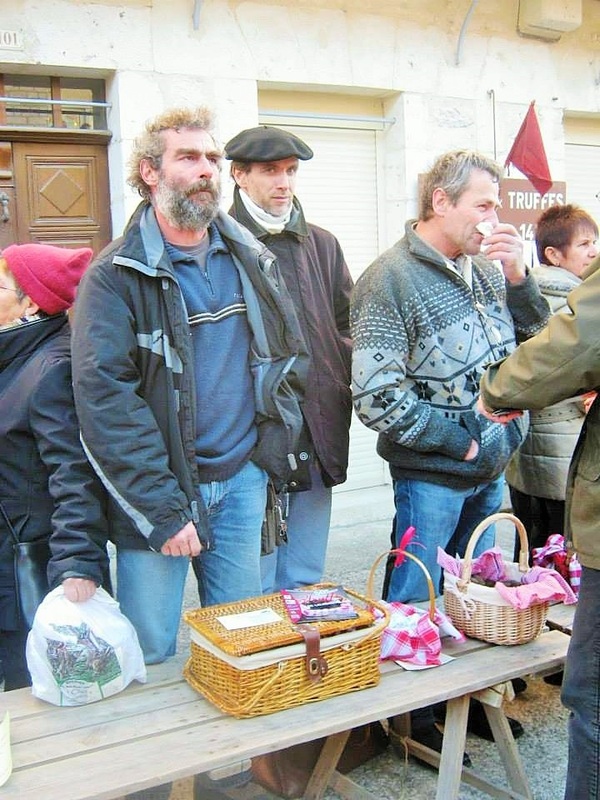 The truffle market in Lalbenque is held on Tuesdays (2pm) from early December to early March and is attended by people from all over France and beyond. Restaurants send their buyers to discreetly purchase the very best on offer. The Tourist Office will have more details including details of any walking tours they may be arranging on Tuesday mornings – a real chance to find out more about this secret crop.